Merry Christmas from all of us at 4dpianoteaching! We’ve enjoyed our first year blogging and sharing our ideas. For Christmas, we have been working on something very special for our readers. And today it is finally ready for you! So without further ado, let me introduce it to you. From reading our many posts, you probably know by now that we love improv. We believe in composing and letting children create music right from the very beginning of piano lessons. Incorporating concepts from lessons makes composing even more useful as a form of repetition. But when children are just beginning and only using those 5 black keys it can be a little tricky to make their music sound really cool. 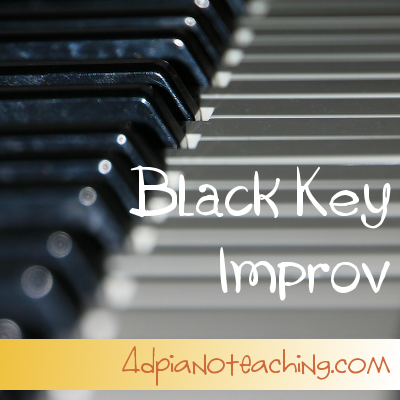 So today we are sharing five accompaniments just for black key improvisation. You can set their hands anywhere – two sets of 3 black keys or a set of 2 and 3…. You decide where the student’s hand position goes based on what you’ve been working on during that lesson. Then use the title and picture above the teacher accompaniment to set the mood and off they go! Composing music with a simple accompaniment from the teacher that makes it all sound AMAZING! Sounds great right? Print these off and enjoy the smiles of delight at your next lesson with a beginning piano student. Introducing WhitneyHawker.com - Free Sheet Music! I appreciate the different styles of these accompaniments. Thank you for sharing! Thanks for stopping by! Hope your student’s like improvising with them. These are just charming! Thanks for sharing! What a great excuse to do more improv with my students.